Motor insurance providers urgently need to create greater clarity and trust around the use of accident and claims data in pricing motor insurance policies. Our LexisNexis Risk Solutions study* of 1,500 motorists regarding policy renewals and claims reporting, found that 58% of responding motorists said they would not inform their motor insurance provider about a minor accident if the repairs cost less than their policy excess. Some 60% of those surveyed believed that declaring this accident information would lead directly to a policy price increase. In addition, consumers are now less willing than they were three years ago for their full claims history to be used for pricing. The study found only 21% of consumers would ‘definitely’ or ‘probably’ report a minor incident to their motor insurance provider. In addition, only one in three (33%) said they would report a minor, non-claim incident involving another vehicle. The older the driver the less likely they are to report the incident: almost three quarters of older consumers would not report such an incident. 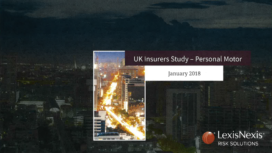 Although 87% of consumers think the number of accidents in which a driver has been involved in during the previous three years should have an impact on the price of their insurance, consumers are now less comfortable about disclosing information on the number of claims an individual has ever made to help pricing. The proportion of respondents in favour of using this claims history information has fallen from 82% in 2013 to 62% today. Our survey also found that while the vast majority (85%) think loyalty should be rewarded, 61% thought discounts could be offered to consumers buying directly from the provider, rather than via price comparison websites. Consumers in the youngest age groups are particularly keen for direct purchasing to be rewarded. 62% also felt motor insurance providers should offer discounts to consumers who they think are likely to buy multiple products from them. Motorists are on guard and reticent to share accident information, no matter how significant, which is often a requirement of the policy. This is creating a cover up culture that insurance providers need to address. First by providing much greater transparency over pricing, such as when claims actually cause premiums to rise, to help build trust with customers. Additionally, consumers would like to be rewarded for sticking with a provider. Other parts of our survey showed that despite many motorists willing to fudge the information they declare at time of application or renewal, they do feel loyalty to an insurer is important, and it is an aspect of their policy and the insurance relationship they are looking for. Overall 85% of consumers think discounts should be offered to customers who remain loyal to the same insurance provider each year. Older consumers are most likely to think loyalty should be rewarded. Another 74% think discounts should be offered to consumers that seem likely to stay with a provider for more than a year. More than six out of ten consumers think discounts should be offered to consumers who are likely to buy multiple products from a provider; and to consumers who buy directly from the provider. *LexisNexis Risk Solutions carried out an anonymous survey, the Policy Renewal and Insurance Shopping Study, 23 January to 5 February 2018. Data collection: web survey using managed online panel as a sample. The sample was 1,500 consumers who have insurance on the vehicle they drive most often, who are equally or solely responsible for insurance decisions, and who purchased motor insurance within the past 12 months.